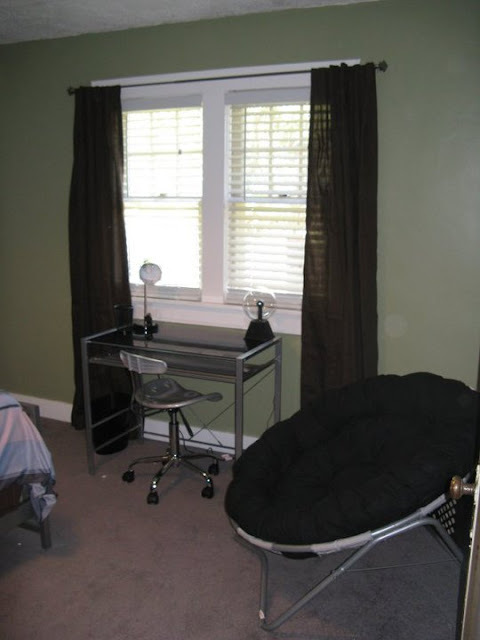 This past summer, about a month before I decided to dive headfirst into the world of blogging, I spent some time making over the bedrooms of one of my nephews and his sister, my only niece. My older sister and I had spoken about a few times ago in the past, but it was finally time for it to happen. I spent a long weekend in Utah painting, putting together furniture, making 147 daily trips to Lowe's and Home Depot (why is it physically impossible to remember everything on your first trip? Or even your second trip?) and drinking unhealthy amounts of Diet Coke while listening to embarrassing amounts of pop and singing into screwdriver-microphones. At least that's how I work. Maybe you're more professional than that. 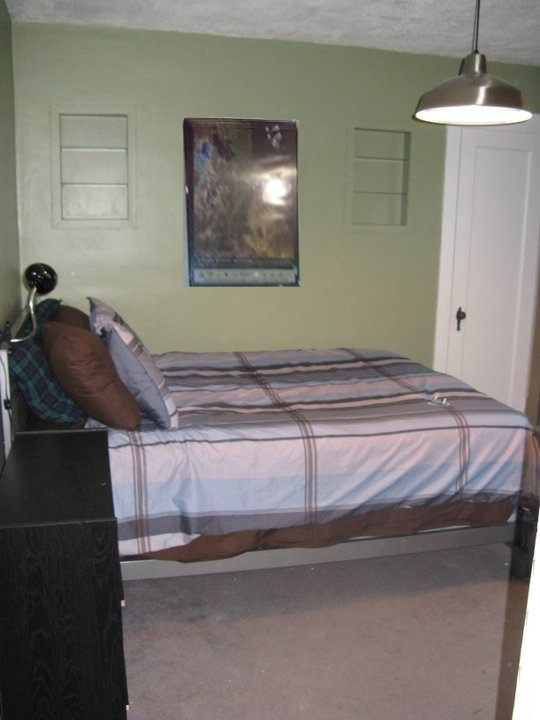 Can you imagine a worse bedroom for a 15-year-old boy? Pink splatter paint? Poor thing! My sister has a great older home with some great features -- nice wide trim and great character. There were also some challenges: the walls, trim, and ceiling were all really dingy colors (unless you count the pink splatters) so there was a lot of painting which definitely turned this into a bigger project than it would have been otherwise. Also, the walls were plaster, so a lot of the older holes in them had grown over time and required some extensive patching. We started from scratch. I got him a new locker-style headboard and bedding set, new furniture, a new light fixture, new blinds, and new wall, ceiling, and trim paint. I decided to paint the trim around the built-in shelves above his bed the same color as the walls to help them fade into the surrounding area since they weren't one of my sister's favorite features of the room. I had a lot to buy and a budget to stick to, so I worked hard to find nice looking, less expensive options for both my nephew's and my niece's rooms. I was surprised to find several really nice items on walmart.com of all places (don't tell anyone, haha!) Add their free shipping to any store to the equation and I was S.O.L.D. Tomorrow I'll share my niece's room! Very awesome. It's so hard to make a design call for teenagers but this is great! Really love your color choices!